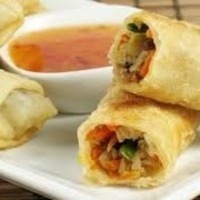 Baked Egg Rolls - A Healthier Baked Version Of The Classic Egg Roll Recipe. Combine celery and carrot in food processor, and pulse 10 times or until finely chopped. Combine celery mixture and cabbage in a medium bowl. Cover with plastic wrap; vent. Microwave at high 5 minutes; drain. Heat vegetable oil in a large nonstick skillet over medium-high heat. Add onion, 1/2 teaspoon ginger, and garlic; sautÃ© 2 minutes. Add turkey; cook 5 minutes. Remove from heat; stir in cabbage mixture, 1 1/2 tablespoons soy sauce, and pepper. Cover and chill 15 minutes. Place 1 egg roll wrapper at a time onto work surface with 1 corner pointing toward you (wrapper should look like a diamond). Trim 1 inch off right and left corners of wrapper. Spoon 3 tablespoons turkey filling into center of wrapper. Fold lower corner of egg roll wrapper over filling. Fold in trimmed corners. Moisten top corner of wrapper with egg white; roll up jelly-roll fashion. Repeat procedure with remaining wrappers, turkey filling, and egg white. Lightly coat egg rolls with cooking spray, and place, seam side down, on a baking sheet coated with cooking spray. Bake at 425Â° for 18 minutes or until golden brown.